After running a 43.45 seconds national record during last week’s OECS Track and Field Championships behind Puerto Rico’s 43.43 time, the British Virgin Islands Women’s 4 x 100m Relay team of Ashley Kelly, Tahesia Harrigan-Scott, Chantel Malone and Karene King, suddenly jumped into the Olympic Games conversation ranked at #20. 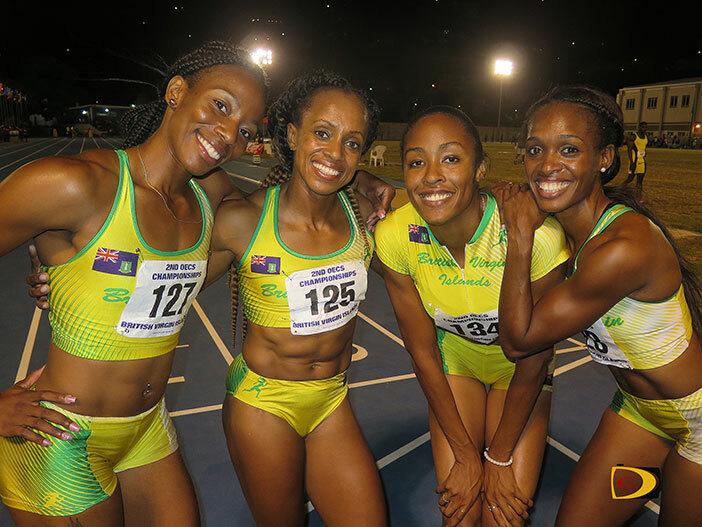 Having run 44.05 seconds earlier, the BVI had an average of 43.75 seconds with a long shot at joining the top 16 teams who will compete at next month’s Olympic Games. But, the European Championships would play a major role in determining who would end up in Rio. Over the weekend, the BVI Joined Puerto Rico, Trinidad and Tobago, a quartet from Jamaica and hosts Bahamas, in the Blue Marlin Classic—the last chance to qualify for Rio—ahead of Monday’s deadline. During the European Championships semifinals on Saturday, France ran 43.06 seconds to bump Puerto Rico from the No. 16 sport. By time the BVI and Puerto Rico lined up in Nassau on Sunday afternoon after the European Championships final, they knew they had to run 43.07 and 43.04 seconds respectively, in order to qualify. Neither came close with Puerto Rico running 43.65 seconds and the BVI, 44.08. While there were plans for a final to end the competition, King encountered muscle problems effectively putting an end to the Rio dream. In the individual 200m, Harrigan-Scott was fourth in 23.39 seconds and King seventh in 24.14. Malone leapt 6.30m to win the Long Jump while Khari Herbert finished third in the 400m in 46.89 seconds. On Wednesday, the first of two BVI teams departed the territory for regional and international competitions. Five athletes left for El Salvador to compete in the NACAC U23 Championships from Friday to Sunday. The team is comprised of: Eldred Henry, Shot Put and Discus Throw; Trevia Gumbs, Discus Throw, Shot Put and Hammer Throw; Tylelle Gumbs, Discus, Javelin and Hammer Throw; Jonel Lacey, 400m and 400m Hurdles; Shaquoy Stephens, 100 and 200m; Khari Herbert, 400m and Taylor Hill, 100 and 200m. Officials, Omar Jones and Angeleta Bernard. On Friday, the territory’s biggest team in its history, will depart for Poland to compete in the IAAF World Jr. Championships, from July 19-24. Comprising the team are: Kyron McMaster, 400m Hurdles; Lakeisha Warner, 400m Hurdles; Tarika Moses, 400m; L’T’Sha Fahie and Nelda Huggins, 100m. Dag Samuel is the official.